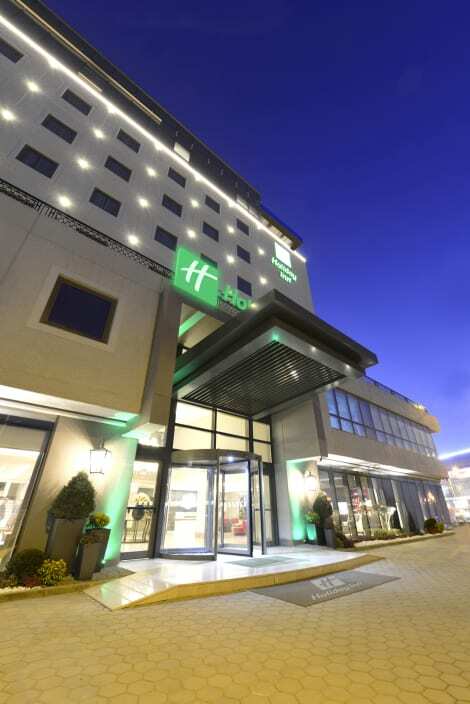 Contemporary hotel in Bursa city centre with meeting facilities, a restaurant and free Wi-Fi Holiday Inn® Bursa City Centre hotel is just off the city's main D200 road. Within a few minutes' walk, local bus, tram and metro stations offer easy access to international businesses at industrial parks like Organize Sanayi Bolgesi, as well as mosques and markets in the city centre. Sabiha Gokcen International Airport (SAW) is two hour drive away. Discover the city's Ottoman heritage at the 14th century Covered Bazaar and central mosques like Ulu Cami and Yeşil Turbe, all within a few kilometers from the hotel. The huge Kent Meydanı shopping mall is a few minutes’ walk away. South of the centre, the Teleferik cable car carries you up Uludağ mountain into a national park. Host your clients onsite in the hotel's three meeting rooms, with space for up to 80 people. All have natural daylight and high-tech equipment, including HD projectors. There's free Wi-Fi throughout the hotel. Meet friends and clients, catch up on email, play videogames and relax in the hotel's marble open lobby. It has an international restaurant, Starbucks coffee shop and a 24/7 Ipoint Business Centre. Kids stay and eat free at this family friendly hotel. After a busy day you can tone up at the 24-hour fitness centre or relax with a drink on the panoramic roof terrace. Grab a bite to eat at the hotel's restaurant, which features a bar, or stay in and take advantage of the room service (during limited hours). Need to unwind? Take a break with a tasty beverage at one of the 2 poolside bars. A complimentary buffet breakfast is served daily from 7:30 AM to 10:30 AM. 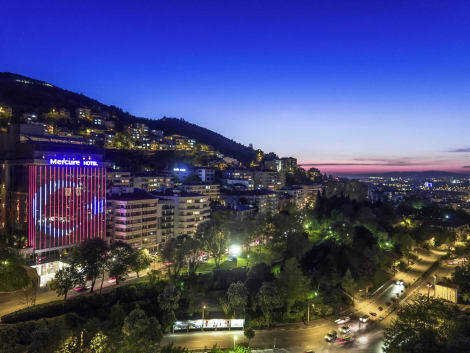 A stay at Hilton Bursa Convention Center & Spa places you in the heart of Bursa, a 4-minute drive from Bursa Zoo and 6 minutes from Buttim Bursa International Textile Trade Center. This 5-star hotel is 11.7 mi (18.8 km) from Uludag University and 24.1 mi (38.7 km) from Uludag Ski Center. Make yourself at home in one of the 141 air-conditioned rooms featuring minibars and LCD televisions. Complimentary wireless Internet access is available to keep you connected. Bathrooms have complimentary toiletries and hair dryers. Conveniences include phones, as well as safes and desks. Relax at the full-service spa, where you can enjoy massages, body treatments, and facials. You can take advantage of recreational amenities such as a health club, an outdoor pool, and an indoor pool. Additional amenities at this hotel include complimentary wireless Internet access, concierge services, and gift shops/newsstands. Getting to nearby attractions is a breeze with the area shuttle (surcharge). Make yourself at home in one of the 60 air-conditioned rooms featuring flat-screen televisions. Complimentary wireless Internet access keeps you connected, and satellite programming is available for your entertainment. Private bathrooms with bathtubs feature complimentary toiletries and hair dryers. Conveniences include laptop-compatible safes and electric kettles, as well as phones with free local calls. This business hotel enjoys a prime setting in Bursa, lying next to Kent Square, in the heart of the city. The hotel is surrounded by ample opportunities for exploration and discovery, with a host of intriguing attractions nearby. The hotel lies within easy access of the old city and the Ulu Mosque. Uludag National Park is just 40 km from the hotel. Yenisehir Airport is 49 km away. This wonderful hotel appeals to business and leisure travellers alike. The guest rooms offer elegance and comfort. The hotel features a meeting room, for the convenience of those travelling for work purposes. Guests can enjoy the utmost in relaxation in the hotel's sauna or massage area. lastminute.com has a fantastic range of hotels in Bursa, with everything from cheap hotels to luxurious five star accommodation available. We like to live up to our last minute name so remember you can book any one of our excellent Bursa hotels up until midnight and stay the same night.